Babies change and grow at an incredible pace, but there are a few great crafts that will allow you to capture their cuteness for years to come. Whether your baby is a newborn, an older infant, or already out of diapers, you can preserve your memories of this special time. Baby feet are adorable and they are proof that your son or daughter was once tiny. Sometime in baby's first year of life, take a little time to make this easy craft. It will take about one hour, not including drying time. 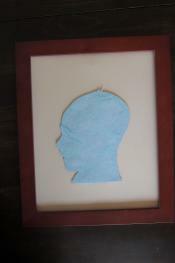 This project uses a product called Creative Paperclay, which is non-toxic and won't irritate baby's skin. Tear off about a two-inch by four-inch piece of the Creative Paperclay block. You can add more clay or use a bit less, depending on the size of your baby's foot. Place a piece of wax paper on your work surface, and put the clay in the middle. Put another piece of wax paper over the top and use the rolling pin to flatten the clay to about half an inch thick. Remove the top sheet of wax paper. Use your fingers to smooth out the edges of the clay until you like the shape. Gently but firmly press baby's foot into the surface of the clay. Lift straight up when you're done. Use a pencil to create a hole in the top of the clay above the baby's foot. Allow the clay to dry overnight. Once the clay is dry, use the sandpaper to smooth out the surface. Carefully brush off any dust when you're done. Apply a layer of acrylic paint. You can highlight the footprint in a darker color if desired. Allow the paint to dry completely. Use the paint pen to write baby's name and the date on the back of the decoration. Allow the paint to dry. Thread a ribbon through the hanging hole and tie it in a knot. You have lots of photos of your baby, but there's something fun about creating a piece of wall art using your little one's silhouette. As he or she changes and grows, you'll have this lasting reminder of the baby years. This easy craft takes about 30 minutes. Use your computer's photo editing software to increase the contrast on your baby's photo. You want a nice sharp outline to follow. It may help to turn the photo black and white. Print the photo in your desired size on regular printer paper. With the pen, trace your baby's profile on the photo to make cutting easier. Use a nice dark line. Carefully cut along the line you made. 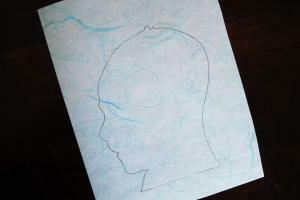 Place the cut-out on the scrapbook paper and trace around it with the pencil. Cut along the line you traced. Use the adhesive tabs to place the silhouette on the white or ivory cardstock. Put the whole thing in a frame, and you're done. Your baby outgrows clothing quickly, and it's sad to pack those tiny outfits away or pass them on to friends. If you want to keep a onesie or sleeper close for years to come, you can make it into a sachet for your dresser drawer. You don't need to have a lot of sewing experience to make this simple craft, and it will take you about an hour. Start by cutting the clothing to create your sachet. You'll need two pieces of fabric that are about four inches by five inches in size. Embroider a design or initials on one of the pieces. You can use your baby's name, birth date, or other important information. Place the two pieces with their right sides together and sew all the way around the four sides, leaving a small section open for turning. Trim your threads and clip each corner, being careful not to cut through your stitches. Turn the sachet right side out and stuff with the polyester stuffing and the dried lavender. Hand sew the opening closed. Cut up your favorite onesies and sleepers and sew them together to make an adorable quilt. 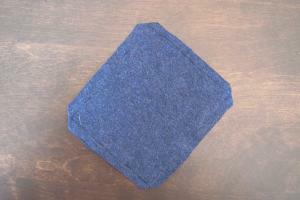 To keep things simple cut the clothes to be a specific size, such as six-inch squares. Then, when you sew them together, everything will fit perfectly. Use a great teddy bear sewing pattern to sew your baby's old clothes into a stuffed animal he or she will be able to use for snuggling. Simply cut a pattern piece out of each item of clothing to showcase several of your favorites. Purchase a shadow box at your local craft store and fill it with some of your favorite keepsakes. Consider including a hospital bracelet, booties, photos, a baby hat, favorite toys, and other special items. 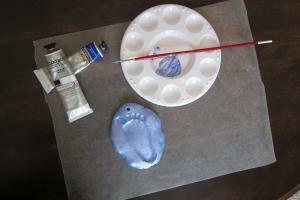 If you enjoy painting ceramics, use your baby's footprint to decorate a special plate or mug. Make sure the paint you use is safe for baby's sensitive skin, and wash it off quickly. Preserving your precious memories of your little one is easy and fun when you try out keepsake projects. You can use baby's footprints, clothing, special toys, and other items to create a reminder of the baby years.